A new state-of-the-art fire station will be officially opened in South Kirkby this week. West Yorkshire Fire and Rescue Service will unveil their new base on Avenue Lodeve, South Kirkby Business Park, on Tuesday. 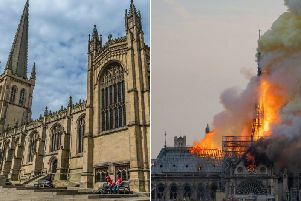 Chief fire officer Simon Pilling, West Yorkshire Fire and Rescue Authority chairwoman Judith Hughes and West Yorkshire deputy lieutenant David Dinmore MBE will attend the event. The station has replaced South Elmsall Fire Station, which closed last month. And the new site has been chosen to provide better support in Hemsworth, South Elmsall, South Kirkby and the surrounding areas. Deputy chief fire officer Steve Beckley said: “The new fire station at South Kirkby represents a significant investment by West Yorkshire Fire and Rescue Authority.